Do you like making up stories about your favourite book characters, or inventing new characters? What happens when you try writing them down – does writer’s block set in? From fear of the blank page to worries over spelling, writing a story can be a real challenge, as you try to use your reading and writing skills to tell a gripping tale. 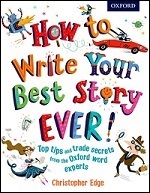 To help you channel your inner author, we’ve asked the author of How to Write your Best Story Ever! , Chris Edge, to share his top 10 tips to help get you writing. Find or make a creative space that's your own – a notebook or journal for you to scribble down story ideas, invent incredible characters or even draw pictures of the places where you want to set your story. A writer's notebook is a private place where you can gather your inspiration. Every writer is a reader and every reader can be a writer too. Think about the books you are reading. What are the best bits? What are the worst? Who's your favourite character and why? Write down your favourite lines and think about how the books you are reading could inspire your own spin-off stories and sequels. Making a mash-up story that mixes together characters from different books, films and TV shows can be a lot of fun. Choose a favourite character from a book and create a story that puts them into your favourite TV show or videogame. How would Sherlock Holmes solve a Minecraft mystery? What would happen if Mr Gum entered The X Factor? Let their imagination run wild as they write their mash-up story! A visit to an art gallery or even just looking at photos in a magazine can inspire a story. Talk to your parents about the pictures you see, and think about characters, settings and situations you can turn into a story. Wordless picture books such as Journey and Quest by Aaron Becker can help you invent their own story to accompany the pictures. If you are a big fantasy fan and love stories about dragons, wizards and monsters, try to create your own magical land. Look at maps of other fantasy lands such as Middle Earth and Narnia and think about the stories that are set there. Making a map can help to inspire fantastic adventures. Writing a story isn't always just about the words. Creating comic books, picture books and illustrated stories can use your artistic talents too. Or you could move from page to screen and get coding to create an animated tale. Try your new story out on your parents. Type it up, print it out, make it look like a book and send it out to friends and family. Look out for creative writing competitions such as BBC Radio 2's 500 Words competition that let children share their story with the biggest possible audience. Why not get your parents to join in and make up their own story too? The novel Lionboy was written by eight-year-old daughter Isabel - and her mum Louisa Young - under the pseudonym Zizou Corder. Work together to make up your own bedtime story and you might find you've written a bestseller! Good luck! From how to overcome writer’s block to what words to use to best effect, How to Write your Best Story Ever! is designed to help all children unlock their story ideas and write their own best ever stories. Packed with entertaining illustrations that will inspire new writer, this book is filled with tips on how to write in particular genres, create exciting characters, and write powerful sentences using metaphors, similes, and idioms.